Orville Walsh of Prince Edward County has updated the list of wind power projects seeking approval under the previous Feed In Tariff program. They are Henvey Inlet (300 megawatts) and North Kent 1 (100 megawatts). Councils across the country are now rejecting over a third of all onshore renewable wind projects – often refusing planning permission even when they meet all the necessary statutory requirements. Official government figures show that in the past year local authorities in England have granted planning permission for just 39 onshore wind projects while rejecting another 23 proposals. Another 17 projects were abandoned during the planning process. In contrast, over the same period councils in Scotland approved 79 projects while rejecting just over 20.
of approval has improved over the past two years, around a quarter of all projects are still being turned down. where local and national politics often trumps fulfilling planning requirements. They point to rule changes announced after the election that mean wind turbines can only get the go-ahead if they have been backed by local people in neighbourhood plans. Firms say that the planning process alone can cost them upwards of £100,000 in fees and other related costs. A spokesman for the Department of Energy and Climate Change said planning decision were a matter for local councils. Ontario’s demand for electricity on December 24th was low based on IESO’s “Daily Market Summary” reaching only 315,336 MWh and “Total Demand” was 385,704 MWh. The hourly Ontario Energy Price or HOEP market, priced it in a negative way valuing it at -$543,843. What that means is the 72,336 MWh we exported cost Ontario’s ratepayers an extra $102,000 based on the weighted average HOEP price per MWh of -$1.41. The average cost of production of those exports based on the IESO November average price of $129.53 (net of the DRC) means the 72,336 MWh exported rang up a cost of $9.4 million to be borne by Ontario ratepayers. That’s not all the costs though! IESO instructed Bruce Nuclear to steam off about 35,000 MWh at an estimated cost of $60.00/MWh or $2.1 million and curtailed 23,500 MWh of wind generation at a cost of around $120.00/MWh adding a further $2.8 million to the day’s costs for ratepayers. The cost of the exports (negative HOEP of $100 thousand) plus production costs of $9.4 million, steamed off nuclear of $2.1 million and curtailed wind of $2.8 million means just one day cost Ontario’s beleaguered ratepayers $14.4 million without factoring in HST costs. Premier Kathleen Wynne, her predecessor, Dalton McGuinty, and her Minister of Energy Bob Chiarelli are responsible for delivering those lumps of coal we found in our stockings Christmas morning. The opinions expressed are those of the author and do not represent Wind Concerns Ontario policy. Big bucks for Loyalist Twp for wind farm? Or crumbs off the developer’s table? Two key agreements with Windlectric have been authorized by the township related to the 74.3 MW (megawatt) project that will see 26 turbines erected on the island. While the project has been authorized by the Ministry of the Environment and Climate Change (MOECC), the Association to Protect Amherst Island has appealed the approval. The start date is therefore unknown as the developer must await the ruling of the ERT (Environmental Review Tribunal) which is not expected until the early Spring of 2016. The term “big bucks” is relative to the size of the project and, perhaps, to the recipient of those “bucks”! In this case the community benefit agreed to is $500,000 annually for the next 20 years. On the surface it sure sounds like big bucks, but the really big bucks will wind up in the pockets of Windlectric’s shareholders. If the 74.3 MW capacity development operates at the expected average of 30% of its rated capacity, it should produce almost 2 million megawatt hours (MWh)of electricity and deliver that to Ontario’s grid — whether it’s needed or not. The math is simple:74.3 X 30% X 8760 (hours in a year) = 1,952,604MWh. We should assume the Windlectric contract was executed prior to the slight downward movement in the feed-in-tariff (FIT) pricing, so for each MWh produced, Windlectric will be paid $135.00/MWh. If you do the math on what their annual revenue will be you might be surprised at the really “big bucks” they will receive! The gross revenue for Windlectric will be about $26.4 million annually (1,952,604 MWh X $135 = $26,396,010) which most of us would consider “big bucks”! The township will get $500,000 of the $26.4 million which amounts to 1.9% of the takeaway by Windlectic. If the Amherst Island residents are, as the Deputy Mayor suggested, put “at ease” they shouldn’t be; council should have bargained much harder. As one resident suggested, the “big bucks” may not be sufficient to even repair the damage to Amherst Island’s infrastructure after construction. And that doesn’t even consider the devaluation1. of property close to the turbines, destruction to migratory birds, plant and animal life, and of course to the 15 to 20 % of people who may feel the effects of the audible and inaudible noise on their health. Property devaluation will lead to reduced assessments and an eventual realty tax loss to the township. Renew your WCO membership today! It’s time to renew (or take out!) your membership in Wind Concerns Ontario. Join us as we continue to communicate concerns about industrial-scale, or utility-scale wind power generation projects on the environment, the economy, and human health. Membership fees are just $15 per person, or $25 for a family of four. Because “secrecy breeds mistrust,” Saugeen Shores Coun. John Rich wants “openness and transparency” from officials with the Ministry of Environment (MOE), and UNIFOR (formerly CAW), concerning previously undisclosed noise test results that “appear to reveal” the union’s Port Elgin industrial wind turbine has operated out of compliance with provincial noise regulations. Through a Freedom of Information (FOI) request, Saugeen Shores Turbine Operation Policy (S.T.O.P) received data detailing 300 complaint-driven observations of noise emissions from the CAW/UNIFOR turbine. The Town’s Notice of Motion said “these observations appear to reveal several incidents where noise emissions from the UNIFOR turbine exceeded the noise standards set by the the MOE.. .which have not been previously disclosed either to the Town of the public at large.” The majority of complaints dealt with sleep disturbance, but also included reports of headaches, nausea, vertigo and other health-related issues. S.T.O.P spokesman Greg Schmalz brought the information to Council in September at a community forum, and after a review of the data, Saugeen Shores Deputy-Mayor Luke Charbonneau, and Councillors John Rich and Mike Myatt, tabled a Notice of Motion at the Dec. 14 Council meeting to invite CAW/UNIFOR and the MOE to “share and review” the data at a meeting with the Town and S.T.O.P. “What we want to see is more openness and opportunity for everyone to have discussion. If there is no problem, there is no issue, then things go the way they are. But if there is a problem, then it must be addressed at that time, but I think it’s important that we add a little sunlight to this and make sure we know what’s going on,” Rich said. He said that although the MOE required, and CAW/UNIFOR promised, third-party testing to verify turbine operation compliance, it is “concerning” that they have no evidence, and hopes the meeting will get the parties together to determine if the turbine is operating within the provincial guidelines. Mayor Mike Smith recounted how CAW/UNIFOR had refused a past Town request for the resources to have independent testing done, and said there’s been no contact between the Town and CAW/UNIFOR for several years. Speaking during the regular open forum prior to the Dec. 14 Council meeting, Schmalz said if the requested meeting occurs, S.T.O.P. will make “simple and reasonable” requests to address the main complaint of sleepless nights by shutting down the turbine from 7 p.m. to 7 a.m.
S.T.O.P also wants the peak daytime noise limit set at 40-decibels, which is the nighttime level for the rest of the province where a 550-metre buffer is required between wind turbines and residences. The setback was not in effect when the CAW/UNIFOR turbine received approval and began operating in April 2013. Schmalz alleges a “cover-up” by the MOE and CAW/UNIFOR officials who promised “open and transparent” sharing of noise tests, yet S.T.O.P. had to make a FOI application to get the data that showed non-compliance. “Just because complaints have been filed doesn’t mean the turbine was non-compliant,” Bondy said. “Is there compliance, or is there not? The only body that would make that determination is the Ministry of Environment, which has now been alleged [to be] in a cover-up operation with the union,” Bondy said, pointing to a 2013 Health Canada study that found there were no harmful effects from turbines, but that “people are annoyed by the sight of them,” Bondy said. Officials with the MOE were not immediately available for comment. LOYALIST TOWNSHIP STANDS TO RAKE IN SOME BIG BUCKS ONCE 26 WIND TURBINES ARE BUILT ON AMHERST ISLAND. THE TOWNSHIP HAS AUTHORIZED 2 KEY AGREEMENTS WITH THE POWER COMPANY. BUT RESIDENTS ARE CONCERNED THAT COUNCIL’S MOVE WAS PREMATURE — AND HOPING THERE’S STILL A CHANCE TO STOP THE GREEN ENERGY PROJECT. NEWSWATCH’S HEATHER SENORAN HAS THE DETAILS. PETER LARGE HAS LIVED ON AMHERST ISLAND FOR 15 YEARS. HE SAYS THE TOWNSHIP’S PLAN TO PUT CLOSE TO 30 WIND TURBINES ON THE ISLAND WOULD RUIN THE EXISTING HERITAGE, BE DANGEROUS TO THE COMMUNITY AND THREATEN WILD LIFE. WINDLECTRIC’S 74.3 MEGAWATT ENERGY PROJECT WAS CONDITIONALLY APPROVED BY THE PROVINCE BACK IN AUGUST. NOW LOYALIST TOWNSHIP COUNCIL HAS APPROVED A ROAD USE AND COMMUNITY BENEFITS AGREEMENT WITH THE WIND POWER COMPANY. TO OFFSET THE IMPACT OF THE WINDFARM, WINDLECTRIC WILL GIVE OVER 500 THOUSAND A YEAR. SOMETHING THE TOWNSHIP’S DEPUTY MAYOR IS HOPING WILL BRING MORE PEOPLE ON SIDE. BUT LARGE ISN’T SO SURE. THE AGREEMENT STATES THE TOWNSHIP CAN DO WHATEVER IT WANTS WITH THE MONEY. TOWNSHIP OFFICIALS ARE STILL WORKING THAT OUT. 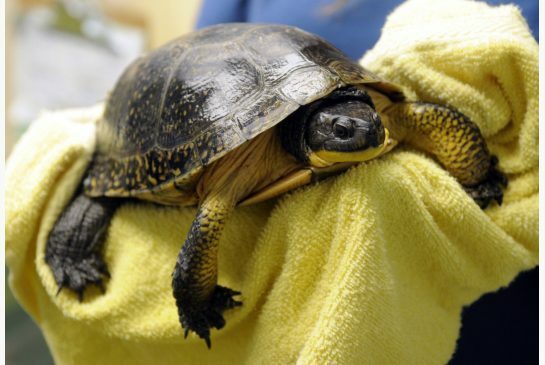 THE ASSOCIATION TO PROTECT AMHERST ISLAND LAUNCHED AN APPEAL OF THE PROJECT APPROVAL IN SEPTEMBER BUT THEY DON’T EXPECT TO FIND OUT IF IT’S APPROVED BY THE ENVIRONMENT REVIEW TRIBUNAL UNTIL MARCH OF NEXT YEAR. HEATHER SENORAN CKWS NEWSWATCH, AMHERST ISLAND. Now that a second Auditor General’s Report has severely criticized Ontario’s electricity system, it is time to rethink a politically motivated energy policy. Action on climate change must not squander crucial time and resources on schemes that may be ineffective, economically unfeasible, or harm human health and the environment. Why did the Government of Ontario choose to ignore the 2011 Auditor General’s Report that questioned the negligible ability of intermittent wind power to lower carbon emissions because natural gas-fuelled back up is required 24/7? The Multi-municipal Wind Turbine Working Group, made up of councillors from jurisdictions where wind turbine development has been most intensive, is ideally positioned to observe first hand the effects of wind turbines on the local community. Adverse health effects are occurring to citizens exposed to wind turbines at approved setbacks. Noise and health complaints have been ignored by government officials. Restrictive Environmental Review Tribunal procedures under the Ontario Green Energy Act make residents’ participation meaningless. Biologists’ observations of degradation of significant habitat and loss of biodiversity near wind turbines have been disregarded. Because of wind power’s difficulty in matching production with demand, a substantial amount of the emission-free electricity from hydro and nuclear plants is being dumped (in order to stabilize the grid) because the Government’s energy policy gives priority to nominally “green” wind energy. This results in throwing away a large portion of the “base load” electricity already paid for by consumers. Our technical consultant, William Palmer, using IESO (Independent Electricity Supply Operator) data, found that in 2014 hydraulic generating stations (water power) were reduced by 3.2 TWh (Terra Watt Hours) due to surplus base load generation. Bruce Power nuclear units were reduced 588 times, each occurrence resulting in bypassing some 300 MW of electrical equivalent of high pressure steam directly to the turbine generator condensers. These transient adjustments result in accelerated wear on the condensers. At the same time, much of the excess wind energy has to be sold outside the province at below production cost. This drives down the market price for electricity and means that Ontario is often forced to dump surplus electricity to our neighbours in New York and Michigan at negative prices – paying them to take it, further penalizing Ontario consumers. the electricity portion of hydro bills has risen by 70%. Not surprisingly the Government has now denied the Auditor General access to Hydro One finances, shielding the company from public scrutiny. A recently published “Council of Canadian Academies Report: Technology and Policy Options for a Low-emission Energy System in Canada” is an example of policy recommendations that fail to recognize the adverse impact on the existing system that the transition in energy systems is already having. It would have been more useful if its authors had given thoughtful consideration to the IESO data and investigated more fully the consequences of wind turbines in Ontario. The Multi-municipal Wind Turbine Working Group has written to the Federal Government, which provides substantial subsidies for wind turbines, requesting reality-based climate change policy decisions for solutions that are actually effective in converting to a low emission energy system without themselves resulting in adverse impacts. I have noticed on several occasions that you seem to have some difficulty understanding the time and place to use the word “profit”. The most recent occasion occurred December 3, 2015 during Question Period in the Legislature when you used it to again claim the export of Ontario’s surplus electricity to our neighbours in New York, Michigan, etc. generated a profit. I’m not sure why the questions related to selling our surplus electricity causes you this failure but perhaps over the holidays you might consider spending some time analyzing what I have included in this letter. I expect you were taught some basic mathematics skills in school but perhaps because of a lack of usage those skills may have been forgotten. Hopefully this letter will refresh your memory and you may even get a grasp of how an actual “market system” works. The intention of this letter is to focus on only one day in the life of our electricity system and the day chosen is November 12, 2015. Visiting the Independent Electricity System Operator’s “Daily Market Summary” for November 12th you find a document that may be the cause of your confusion. That summary shows “Market Demand” averaged 18,210 megawatts (MW) per hour for total demand of 437,040 MWh (24 hours X 18,210 = 437,040 MWh). Ontario Demand was much less averaging 15,165 MW or 363,960 MWh for the 24 hours. 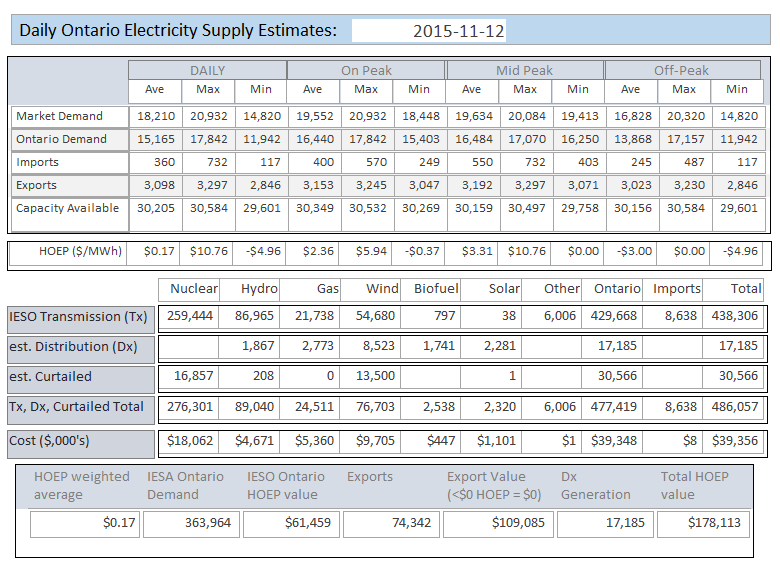 The difference of 73,080 MWh represents Ontario’s net exports for the day. Now what IESO don’t include in their summary is MWh curtailed (principally wind), or spilled (hydro) or steamed off (nuclear). This curtailed, spilled, etc. power can be significant and cost ratepayers as payment to all generators include undelivered production. In the case of gas plants it contains “idling costs” to back up wind and solar. Bob, hopefully you are still with me to this point so I will carry on. By looking at IESO’s summary you would not be aware of the above costs, nor would you know the actual cost of production (Market Demand) if you simply looked at what they refer to as “Energy Prices ($/MWh)”! On this particular day the latter averaged (weighted) 0.17 cents per MWh. This may be where you are having your problems as you may have assumed the costs of producing the “Total Demand” for the day was only $82,796.80, i.e., 487,040 X 0.17 cents = $82,796.80 — but that is the wrong assumption! The HOEP (Hourly Ontario Energy Price) referred to is really what the “traders” valued Ontario’s production at for this day. In other words, the demand for our power on November 12th wasn’t very valuable in the market so prices offered were low. As you have probably been told, the actual price ratepayers are charged for power includes what one of your predecessors referred to as the “Provincial Benefit”. It turned out to not be a “benefit” so the term was changed to the “Global Adjustment Mechanism” (GAM). GAM reflects contracted prices for the various generation sources and they can be very high in comparison to the HOEP. As one example you or your predecessors contracted for rooftop solar at $702.00/MWh and on the day in question even though they were paid that amount IESO were only able to sell it for the .17 cents/MWh contained in their summary. Hope you are still with me but to clarify we might have paid say IKEA $702.00 for one MWh of generation which we then sold for .17 cents meaning we lost $701.83 for that MWh. Hope you get that? Now in an effort to help you to better understand the math behind your Ministry’s rather confusing arrangements, I contacted my good friend Scott Luft and asked if he could produce a one-page summary estimating contracted costs for November 12th. He did and I have attached his summary1. (too bad IESO couldn’t do this) and while the production numbers are out by a few MWh (equivalent to about five minutes of demand) as compared to IESO it reflects actual costs including: contracted prices, costs for curtailed, spilled, steamed off power and embedded production (IKEA is the example as noted above) which Scott refers to as Distribution (Dx). As you will note, Scott’s estimate of the cost of the day’s electricity (he excludes conservation, transmission, IESO’s costs, etc.) comes to $39.5 million, i.e., the “cost” of the GAM of $39.3 million and the “HOEP” of $ .2 million. OK, we are now ready to complete the final math on this exercise! Using the actual cost of generation from Scott’s summary you will note the per MWh cost of “Ontario Demand” of 363,960 MWh is approximately $108.00/MWh. The math exercise is simple: divide the $39.5 million by the 363,960 MWh! The conclusion, Bob, is Ontario ratepayers paid about $7.9 million for the net exports of 73,080 MWh (73,080 MWh X $108. = $7,892,640) and sold them for .17 cents each generating $12,424 (73,080 X .17 cents = $12.424). So we ratepayers paid $7.9 million for the exports but got only $12,000 from our friends — that, Bob, is a loss of $7.9 million, not a profit of $12,000. If you have trouble with any of the numbers I would be pleased to sit down with you and review them again but hopefully I have spelled it out sufficiently for you to understand. In the meantime I certainly hope you and your family have a Merry Christmas but please do remember to do your very best to only turn your Christmas lights on during “off-peak” periods to support conservation and to “saveonenergy”. P.S. The next lesson will be in respect to the cost per MWh by generating source followed by a special session on how “conservation” drives the costs up for ratepayers. Please note Scott has produced these daily summaries, so far, for November 1, 2015 to December 12th.